Test Drive automated cloud-based workflow solutions powered by the Ultimus CPS platform. Our private, self-guided Test Drives allow you to use actual Composed Process Solutions in several business process participant roles and to experience first-hand the power of business processes automated using our game changing “industrial approach” to low-code development. 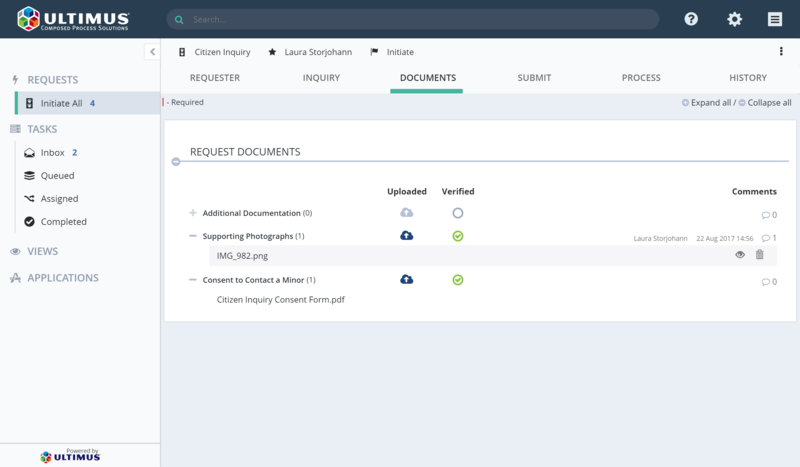 Our first Test Drive, Citizen Inquiry, is a simplified version of CPS solutions used by a variety of cities, towns, government entities, and law enforcement organizations. It efficiently automates the fulfillment of citizen information requests, complaints, compliments, and suggestions and ensures accurate follow-up and response within pre-determined legal or policy timeframes. 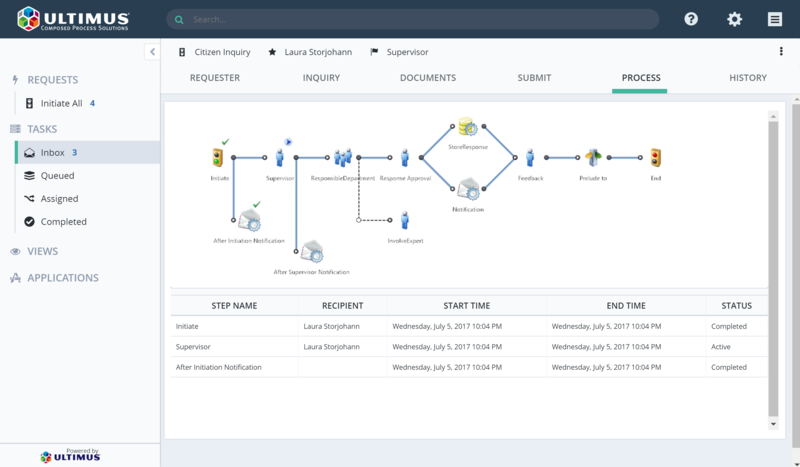 Citizen Inquiry showcases one of the many key benefits of Composed Process Solutions: the ability to create “software families” - dozens or even hundreds of solution variants that inherently function and are managed as one larger solution. 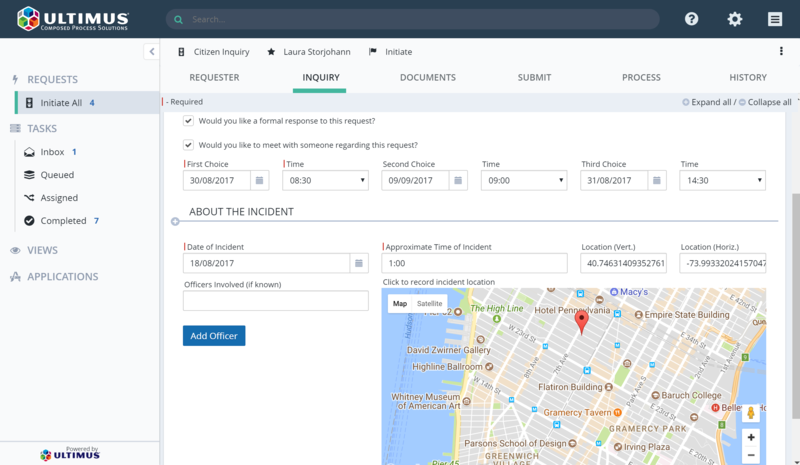 Creating Citizen Inquiry solution families allows our customers to quickly meet the unique and divergent needs of their entire organization – from school departments, to police departments, even nuclear energy regulators – without complexity, costly integrations, and duplication of effort. Looking for a Custom Test Drive Instead? Composed Process Solutions technology takes Low-Code Development to the next level. Using principles of modern engineering and automated manufacturing, CPS generates automated business process solutions in a fraction of the time and at a fraction of the cost of other Low-Code approaches. And CPS applications leverage the powerful, industry-leading process capabilities of Ultimus Adaptive BPM Suite 2017 and Ultimus Advanced Task Server 2017, the only technology for in-production process performance and scalability. SaaS customization and rigid pre-packaged apps are a competitive disadvantage. Applications delivered at the speed of digital; composed using proven, re-usable digital assets; that eliminate the complex integration of software islands… is transformative. True digital transformation – just give us an hour and see your workflow application, powered by CPS, by week’s end. It’s free! Please add CPSTestDrive@ultimus.com to your contacts to ensure email deliverability directly to your inbox. If you encounter problems with our registration form, please disable Adblockers and do not block cookies or scripts for CPSTestDrive.UltimusCPS.com.